Jagannath University is situated in the southern part of the city of Dhaka near the Buriganga. This prestigious educational establishment has a history of about 150 years which started in 1858 when Dhaka Brahma School was founded in 1858 by Dinanath Sen, Prabhaticharan Roy, Anathbandhu Mallik and Brajasundar Kaitra. The name Jagannath school was given by Kishorilal Chowdhury, the Zamindar of Baliadi who took over the school in 1872 and renamed it after his father's name. In 1884, it was raised to a second grade college. Law was one of the first courses introduced in the college. A common management committee administered the school and college until 1887, when the school section was separated to form an independent school named Kishore Jubilee School. It is now known as K L Jubilee School. The administration of the college was transferred to a board of trustees in 1907. In the following year, it became a first grade college. The college started with only 48 students and in five years, the roll raised to 396. In 1910, Raja Manmath Roy Chowdhury, the zamindar of Santosh, tangail affiliated the Pramath-Manmath College of Tangail with Jagannath College.It was known as the best equipped private college in Dhaka as early as 1910. 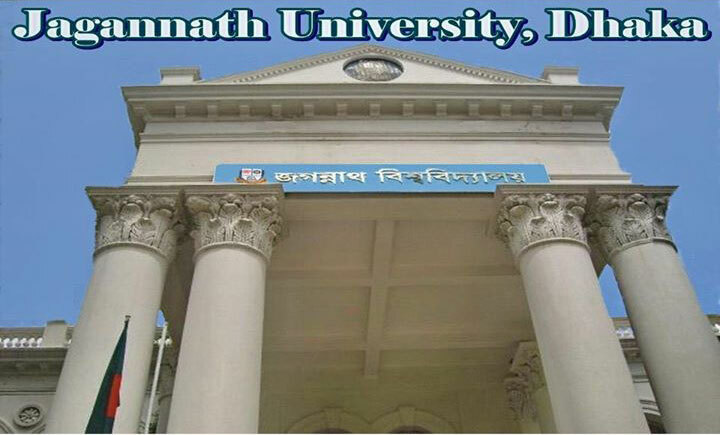 With the establishment of Dhaka University in 1921 the college had to stop admission in Degree courses and was renamed Jagannath Intermediate College. This status was changed after 28 years in 1949, when it reopened Degree classes. The college was taken over by the government in 1968. Jagannath College opened honours and masters programmes in 1975. That year the government once again took over the college and upgraded it into a postgraduate college. In 1982, the college closed its programmes of intermediate level.The college introduced evening shifts in 1992.The college was transformed into the Jagannath University in 2005. At present the University has 22 departments under 4 faculties. The faculties are Science, Arts, Business Studies and Social Science. Now 271 teachers are engaged in providing quality education of around 27000 students. on diverse areas. The teachers and students of the college took active part in the Language Movement of the early 1950s, the mass movements of the 1960s and the War of Liberation of the country in 1971. The college produced tens of thousands graduates. Many of them have become famous at home and abroad. Noted among the alumni of the college are sufi motahar hosen (poet), Abdul Hamid (sports organiser and sports journalist), Bhabatosh Dutta (economist), Premendra Mitra (writer and poet), AR Yusuf (Bar-at-Law, State Minister of Bangladesh in early 1980s), A KMA Rouf (artist), Anisuzzaman (educationist, researcher), and Brozen Das (swimmer, the first Indian to swim across English Channel). The Management of University is striving to make this establishment as a center of excellence for creating successful and productive citizens of Bangladesh. Copyright notice: Some contents and images are taken from wikipedia.org (under GNU-FDL) and copyright goes to wikipedia.org and other source sites, photographers and article writers.